With the addition of NPR's colossal catalogue, Spotify's platform is expected to be an even bigger magnet for podcast junkies across the globe. Public radio podcast lovers, clear your schedules: Spotify users now have the NPR podcast catalogue at their fingertips. 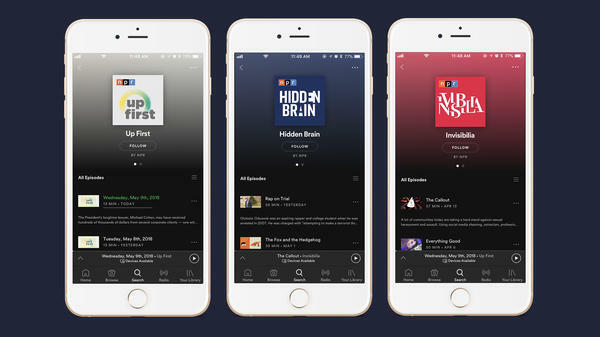 From classic NPR favorites like Fresh Air to TED Radio Hour, to the media giant's latest viral titles like Invisibilia, Hidden Brain, and How I Built This, all of NPR's podcasts have a home on Spotify. Fans new and old are part of the one-third of Americans who listen to podcasts, with 12 percent streaming 10 hours or more each week. As podcasts bleed ever more into office talk and dinner conversation ("You have to listen to this episode of NPR's How I Built This! "; "I'm obsessed with NPR's Hidden Brain podcast - it's like they know me!") they're increasingly a way to stay culturally relevant and on top of the latest trends. We listen to them at home as we unwind, on the road or rails as we commute, and while we work—and we're listening to them on Spotify like never before. Why have podcasts become the media of the moment? NPR's Chief Marketing Officer Meg Goldthwaite explains. "Podcasts are stimulating. You get to imagine jumping out of a plane with Invisibilia host Hannah Rosin and her 74-year-old mom, or eavesdropping as Shankar Vedantam crawls through someone's thinking on Hidden Brain." "And podcasts can challenge you. They can inspire you. They can change the way you listen to your world," she said. "Our audience numbers show that people crave that and want to access podcasts on as many platforms as possible. Whether it's getting out the door with Spotify's Today's Top Hits or Are & Be playlists, or wrapping up your day with NPR's TED Radio Hour, listeners are now able to do it all from one app on Spotify." To date, people have spent hundreds of millions of hours listening to podcasts on Spotify, the number two podcast listening destination in the world. With the addition of NPR's colossal catalogue, Spotify's platform is expected to be an even bigger magnet for podcast junkies across the globe. NPR is arguably one of the biggest and most respected names in podcasting, with top-notch—and, in many cases, award-winning—podcasts and longtime listeners. For NPR, sharing its eclectic podcast archive on Spotify instantly builds expansive global awareness of its programming. Meanwhile, the talented podcasters of NPR gain access to millions of Spotify listeners who might not otherwise stumble upon and listen to their shows. "For both Spotify and NPR, joining forces just makes sense, and we're delighted to bring NPR podcasts to Spotify users," said Dossie McCraw, Global Head of Podcast Partnerships at Spotify. "Podcasts are gifts you give yourself in moments of the day when you want to catch up on the news or hear thoughtful commentary on issues affecting us all or just have some fun with a game show like Wait Wait... Don't Tell Me!" "This collaboration is a huge step towards greater discoverability," said Goldthwaite. "Be it science or music or news or conversation, NPR podcasts on Spotify are another place for audio-hungry ears to feast." To listen to NPR's robust podcast library on Spotify, check out the Podcast Hub under Browse.